Custom built from the bottom up. 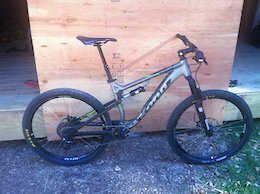 This bike is super fun on the trails and very versatile with upgraded 3 stage CTD Fox suspension, 27.5 wheels, dropper post, and a cane creek angleset headset to dial in the headtube angle. I upgraded to a Hightower, otherwise I'd still be riding this bike. Frame has 125 mm of rear travel with a 2016 Fox Float CTD shock. Front fork: 2015 Fox Float Factory FIT CTD with 140mm (recently serviced by suspension experts). Wheels: 27.5 Stans Flow EX with X9 hubs and SLX cassette Handlebars: Race Face Carbon SIC6 780mm Headset: Cane Creek Angleset with 0, 0.5, 1.0 deg. cups. Brakes: Shimano SLX - ICE Tech rotors Shifter/Deraileur: Shimano XT 10spd Crankset: Turvativ AKA Seatpost: Crank Brothers Kronolog Dropper Saddle: Anvil Bike is in great condition with the usual chainstay paint chips and some cable rub on the frame. I put in a new bushings kit and the suspension works great - but with a 2.3 rear tire I started getting a little tire buzz on the seat tube on big hits. This can be managed by keeping the rear suspension at the correct pressure for your riding. I hope you will enjoy this bike as much as I have! This is a great race bike and it served me well in 2010 and 2011 but sadly hasn't seen much action since. New brake pads and upgraded tires to Maxxis Ardent. 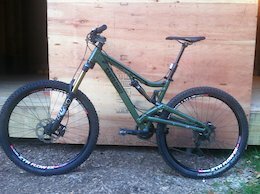 It is time to pass it on to someone who is looking for a very responsive full suspension. Giant's Anthem X2 gives you everything you want and need for technical XC: super-light quickness, torsional stiffness, big tire clearance and 100mm of Maestro-equipped travel. The Shimano XT shifting, the Mavic wheels with SLX hubs, the Giant controls; these all add up to a versatile ride that's light enough to climb all day, tough enough for all-day epics in the backcountry and fast enough to race. The Anthem is equipped with a Fox fork and shock so you can custom-tune the feel of your ride for all your varied disciplines.